FREETOWN, Aug 23 2017 (IPS) - In the early hours of Monday morning, August 14, torrential rains hit Freetown, Sierra Leone’s capital city. Several areas of the city were flooded, as houses were either partially submerged under water or destroyed. 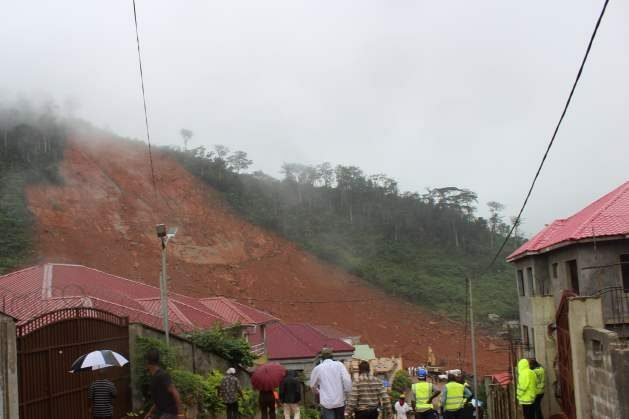 In Regent, a mountainous community on the outskirts of Freetown, extreme flooding triggered a mudslide on Mount Sugar Loaf, burying several houses and underneath dirt and rubble. Some families were completely wiped out, and in some cases, only one family member survived. Most of the victims lived in little shacks and tin houses in informal settlements at the bottom of the mountain, and in other areas affected in Freetown, the victims were slum-dwellers living near the sea-level, close to rivers and streams, with very poor or no drainage or irrigation systems. Close to 500 people have lost their lives, and approximately 600 people remain unaccounted for, according to Red Cross reports . More than 2000 people have also been rendered homeless in Freetown and are in need of food, clothing, medicine and shelter. In Regent, many more are believed to be buried, as excavation continues. Flooding is nothing new to Freetown, as almost every year, floods have occurred in various communities in the city.Many areas in Freetown are disaster prone due to poor city planning, lack of effective drainage systems, and severe deforestation and many of the communities who live in high-risk disaster-prone areas are informal settlements, made from a conglomeration of shacks and poorly-built houses. Sierra Leone remains one the world’s poorest countries, ranked 179th out of 188 countries on the United Nations Development Program’s Human Development Index. Lack of opportunities in other parts of the country, attract many people to move to Freetown which has experienced mass migration since the 11-year civil war which ended in 2002. Freetown hosts approximately 1 million people out of Sierra Leone’s 7.4 million people, leaving it overcrowded and overstretching the city’s capacity to provide proper sanitary conditions and essential resources like running water and electricity to its habitants. In 2012, a cholera crisis in Freetown led to declaration of a national emergency. 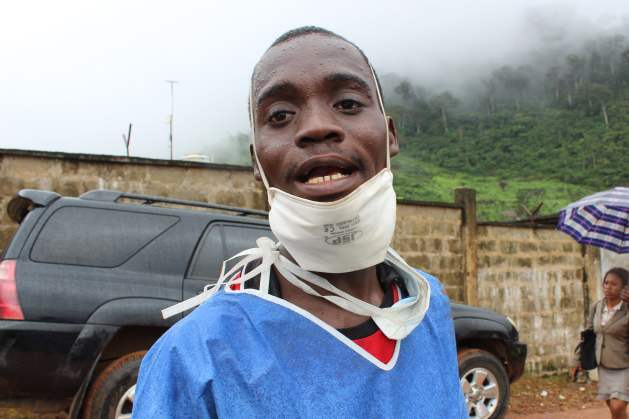 The outbreak resulted in 298 deaths, mostly from Freetown’s poorest communities. In September 2015, severe flooding in Freetown killed 10 people- and left approximately 4000 homeless. However, a natural disaster of such magnitude is unprecedented in Freetown. Abu Sesay, one of the volunteers, lives close to where the mudslide happened in Regent. He has been helping to dig up bodies, and was a part of rescue efforts on that fateful morning. “We heard the noise early in the morning, and didn’t know what was happening. It was raining heavily, but we could hear people screaming”. He then mobilized other young people in the area and they started to help pull out those who had survived. After the rains subsided, they uncovered bodies that were trapped in the mud and debris. Sia Fayia also lost her neighbors in the mudslide. The family of four were completely buried under the rubble and only two of the bodies have been recovered. One of them, 27-year-old Sia Kelli, was in her final year as a student at the Fourah Bay College, University of Sierra Leone. “We’ve never seen anything like this before, this is beyond shocking”, Sia Fayia lamented. Last week Thursday, authorities conducted a mass burial for 461 unidentified persons at the Waterloo cemetery, where Ebola victims had been buried too, as bereaved families looked on and wept. Some wept for those who were confirmed dead, while others did not know what happened to their loved ones-they could possibly be among those being buried. Relief has poured in -from international donors such as DFID, and humanitarian relief agencies such as the Red Cross and Save the Children. Individual donations across the country have also poured into Donations centers, with people providing essentials such as care packages, bottles of water and bags of rice, to not only Regent, but other communities such as Culvert, Kamayama and Kaningo, which were also severely affected by floods. The president, Ernest Bai Koroma has called for urgent help from the international community, stating at a press conference last week that the scale of the disaster was overwhelming. However, Amnesty International produced a damning report on the disaster on Monday August 21, indicting the government of Sierra Leone for not doing enough to prevent such a tragedy from happening. “Due to a lack of regulation and insufficient consideration for minimum standards and environmental laws, millions of Sierra Leoneans are living in dangerously vulnerable homes.”- The statement from Amnesty International read. As Sierra Leone struggles to rebuild after the devastation caused by an 11-year civil war and the Ebola epidemic, there are lessons to be learned from this disaster, and proper environmental protection policies will need to be enforced, in order to safeguard the lives of Sierra Leone’s citizens.